Ditching carpet in favor of hardwood eliminates potential health hazards and replaces your floors with something easier to clean and maintain while adding to your home’s value. Today, a wide range of materials and new technologies are making it possible to say goodbye to dirty carpet forever and find hardwood flooring at a lower cost. 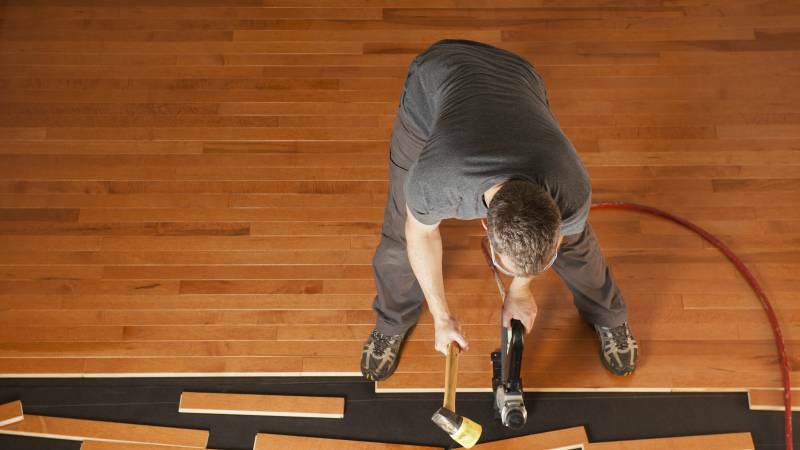 Here’s how you can save by switching from carpet to hardwood. When you picture hardwood flooring, you probably think of solid hardwood made from durable wood species such as oak, hickory, or mahogany – but technology has provided several newer, cheaper options in recent years. Laminate flooring, for example, provides the appearance of wood at the fraction of the cost of real hardwood, ranging from $0.50 to $6 per square foot for materials according to Home Advisor. It’s created from layers of compressed fiberboard covered with a laminated image of wood grain. Another cost-effective option is engineered wood. Although more expensive than laminate, it’s still cheaper than solid wood. The harder and rarer the wood, the more expensive it is. Higher quality also demands a higher price. Bamboo and cork floors are also becoming increasingly popular because the materials are renewable and offer relative comfort when compared to solid wood floors. Bamboo is more moisture-resistant than wood, and cork provides natural insulation. Should you decide to go with a bamboo or cork floor instead of a hardwood option, you can expect to pay $2 to $8 per square foot for materials. Bamboo comes with an installation cost of $2 per square foot, and cork can cost less than $1 for the same area, Home Flooring Pros reports. Carpet may feel cozy under your feet, but this seemingly innocuous flooring is hiding some nasty secrets. Over years of wear and tear, mold, mildew, fungus and dust can build up in your carpet’s fabric, carrying bacteria and viruses. And it’s impossible to remove these unwelcome “guests” by vacuuming. Even if you vacuum your carpet daily, it’ll still need a professional cleaning twice a year – an additional cost you won’t need with hardwood. Warranties are also often much shorter with carpet than hardwood, which means you’ll end up paying out of pocket sooner to replace your dirty, ugly carpet. While carpet warranties are usually about 10 years, many hardwood floor warranties are 10 to 15 years longer and can be transferred to the next homeowner, which means you could even save from someone else’s smart decision to switch to hardwood. The National Wood Flooring Association (NWFA) indicates that U.S. real estate agents believe houses with hardwood flooring are easier to sell – and they sell for more money and sell faster than those with even brand-new carpet. Although there’s no direct correlation between a home’s value and the type of flooring, the visual appeal of hardwood floors is increasingly popular and it’s a huge reason why many real estate agents prefer them in the houses they sell. Professional installers have the knowledge and experience to advise you on the best options for the rooms where you want to switch to wood flooring. They know how to measure accurately so materials aren’t wasted and can approach the installation in the most cost- and time-efficient way. Keep in mind the cheapest service isn’t always the best, and well-known stores offering installation with your purchase may not provide the best value. Consider all options in light of your budget and the quality of work you desire. This will help you choose the best value instead of automatically gravitating toward what’s affordable or familiar. What matters is getting the floor you want installed the right way the first time so it lasts for decades.